(Uzbekistan Today) – $432.8 mln will be allocated for Uzbekistan’s program of modernization of water facilities in 2015-2019, reports Uzbekistan Today news agency. 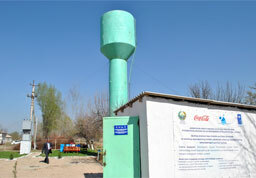 A water supply and sanitation system in remote rural areas of the Zarafshan River Basin. Head of the foreign economic relations and investments department of the Uzkommunkhizmat Agency Rifkat Rakhmatullaev said the drinking water supply program will be coordinated by the special state commission. The commission will compile a list of water facility objects subject to construction or repairs. The UNDP Country Programme Action Plan 2010-2015 estimates that only 21% of the rural population in Uzbekistan have access to clean water. Those living in the Zarafshan River Basin are disproportionately affected. In the 1980s, during the Soviet era, rural water supply systems were constructed and managed by sovkhoz and kolkhoz (state and collective farms), which were also responsible for operation and maintenance costs. From the 1990s, responsibility for rural water supply systems was transferred to two companies: Obihayot and Suvoqova. However, poor maintenance of the systems led to their deterioration and to water distribution becoming erratic or collapsing altogether. A rapid increase in Uzbekistan’s rural population has stretched the capacity of the water supply system over the last two decades, while at the same time the level of pollution in drinking water has increased. Both factors have resulted directly in a significant increase in infectious diseases in both children and adults. Lack of access to clean drinking water endangered that most valuable thing, people’s health, making the water supply issue a top priority. The government has continued to increase the development of water supply systems through their state programme, which includes improving the rural water supply and sanitation to increase access to these vital services and improve public health. Drinking water supply in rural areas was being developed on the basis of special programs being consistently implemented. Within the years of independence 21,210 km of water supply lines have been built in rural areas, and their total length increased 2.3-folds as compared with that during the Soviet period of development. However, despite high rate of water supply network construction, there is a problem of water supply for remote and hard-to-reach rural settlements.